Erielle Reshef reports from an Iron Dome missile defense site in Ashkelon during a 2012 rocket barrage. Reshef prepares for a broadcast in the IBA studios. Reshef interviews Israeli President Shimon Peres for a YouTube special. Shrapnel from a Grad rocket fired by Gaza militants into Be'er Sheva, Israel. Overlooking the cheering crowds in Gilad Shalit's hometown of Mitzpe Hila - October 2011. Between 2010 and 2012, Oklahoma City native Erielle Reshef reported twice from Gaza during instances of cross-border violence between Israelis and Palestinians. She stood next to an Israeli Iron Dome missile defense system covering the firefight for the Israeli Broadcasting Authority (IBA). But even as the Katyushsa rockets headed toward the country, she told KGOU’s World Views she never once felt unsafe. Listen to Suzette Grillot's conversation with Erielle Reshef. 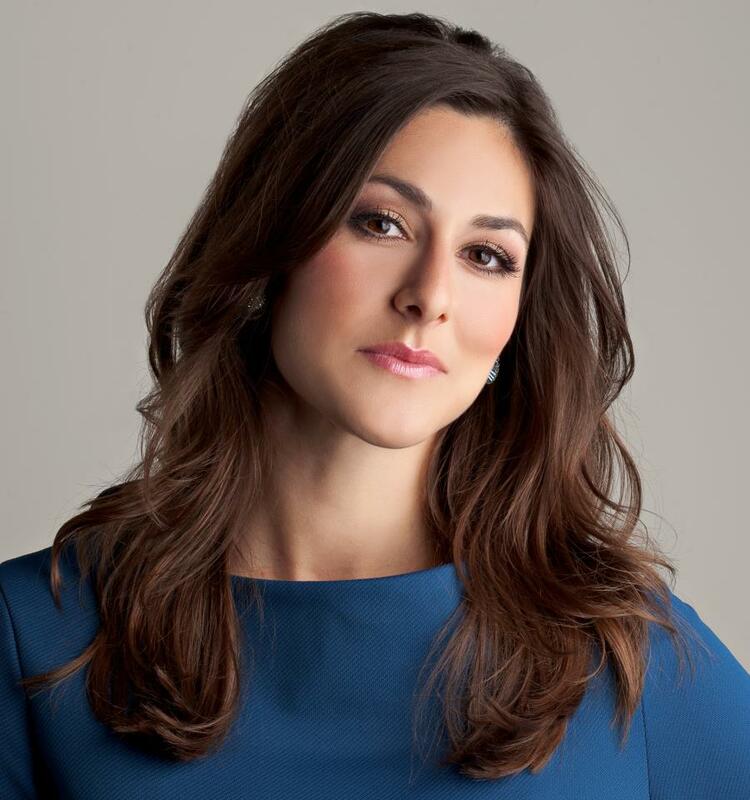 KOCO-TV reporter and anchor Erielle Reshef. Reshef also reported from northern Israel in 2011 when Hamas militants released Israeli Defense Forces soldier Gilad Shalit. Israel freed 1,027 Palestinian prisoners in an exchange deal after Shalit spent five years in captivity. As a journalist, Reshef says she has a window into peoples’ most intimate thoughts and moments. Despite the region’s troubles, she saw countless interactions between Israelis and Palestinians she described as friendly and loving. I saw all of these convulsions in the Arab World, and all of the different political aspirations of the people in the Arab World. So that was absolutely fascinating. I actually anchored the broadcast where Hosni Mubarak was ousted. That was a tremendous experience. Growing up reading the history of Israel, the history of Egypt, the history of the relations between the two, it was an incredibly important topic for the people that were tuning into my broadcast to hear about Hosni Mubarak being deposed, and that comes with a lot of weight. When I show people a picture of Tel Aviv, they're shocked because they don't realize it's a beach town with discos, and with lots of fabulous restaurants, and seaside experiences. Really active, vibrant gay community. Something that would never really notice, so that was something that was really compelling to me. It really transcends all of the different conflicts that occur in the world. When I would walk the streets of Tel Aviv as a female by myself at two in the morning, I felt incredibly safe. I never had my purse snatched. I never was mugged. I never worried about a drive-by shooting. I'm not saying that Oklahoma is a violent place by any stretch, because I absolutely love this place, but there are definitely drawbacks sometimes to certain stories that we do. I have more of a feeling of fear sometimes in the stories that we cover here in Oklahoma than I sometimes did in Israel, and I think it's just a very different sense of personal security. KGOU relies on voluntary contributions from readers and listeners to further its mission of public service with internationally-focused programming and commentary for Oklahoma. To contribute to our efforts, make your donation online, or contact our Membership department. SUZETTE GRILLOT, HOST: Erielle Reshef, welcome to World Views. ERIELLE RESHEF: Thank you so much for having me. GRILLOT: It's great to have you here. You are from Oklahoma, so you have your roots here. But you've traveled quite a bit. You've lived overseas. Studied in another state, and ended up in Israel of all places doing journalism. Give us a little bit of background about it. How you went from growing up in Oklahoma City to anchoring the news in Israel. RESHEF: It's quite a leap. GRILLOT: ...what an amazing experience, but then to leap from that experience into journalism. How does that happen? RESHEF: I come from a very non-traditional background in journalism. I never expected that I would become a journalist. I finished my degree at the Interdisciplinary Center, and that very same day - we used to watch a program called IBA News - which was the only English broadcast in Israel. So it's diplomatic affairs, it's economic affairs, sports, everything you can image about Israeli society, but it's told in English. Like I said, it's the only broadcast. So my family was actually visiting Israel, and we were all watching the broadcast, and it was my very last day at the IDC, and I was still trying to figure out what I wanted to do. And they made a joke on the program about how they were looking for new anchors. So they started listing criteria - one of them being that you're an Israeli citizen, that you're an American citizen, that you have a background in international affairs, and of course you have, most importantly, on-camera presence. Well, my family turns around to me and they say, "Well, it doesn't really matter that you don't have the on-camera presence part, because we think you can do it, so you should apply for this job." GRILLOT: Well that's an amazing thing in terms of luck and timing. You just happened to hear this announcement, and there you go. RESHEF: Exactly. I call it my serendipitous twist of fate. So I, very reluctantly at the time, listened to my husband, my father, and my mother, who all told me I should apply for this job and blindly sent my CV to the people that were reading. At first, they sent me back a note - a very lovely note - saying "We really appreciate your experience. We think you have the right experience, however, you have no on-camera experience whatsoever, so no thank you." Well, so I accepted that, and my husband said "Absolutely not. You don't take no for an answer. Send them an email and say you can't say no until you at least meet with me." So I sent that email, also very reluctantly, and finally I found out that it pays off, because the then-chief anchor there that was making the decision called me in for a group audition. I came in with a series of other journalists who had far more experience than I did, and read blind from the teleprompter for the first time in my entire life at that audition. The very next day I got a call from our news director telling me he wanted to hire me. Which was pretty remarkable. I thought he might've misread when he was going down the list of journalists that they had interviewed, I thought maybe he had looked at the wrong phone number and called me up instead of someone else, but I was, needless to say, extremely shocked and excited, and that started my career. GRILLOT: So definitely a very (non-)traditional entry into journalism, but nonetheless, you became a very traditional journalist in the sense that you've reported all over Israel. You've engaged in meeting all kinds of interesting people and topics. Tell us a little bit about some of the most interesting things you did while you were reporting in Israel. RESHEF: Well, very relevant to the course of events that we're seeing now in the Middle East. I was there when what's now been dubbed the Arab Spring began. So I saw all of these convulsions in the Arab World, and all of the different political aspirations of the people in the Arab World. So that was absolutely fascinating. I actually anchored the broadcast where Hosni Mubarak was ousted. That was a tremendous experience. Growing up reading the history of Israel, the history of Egypt, the history of the relations between the two, it was an incredibly important topic for the people that were tuning into my broadcast to hear about Hosni Mubarak being deposed, and that comes with a lot of weight. So that was one of my, I think, highlights of my experience. I also was up in the north of Israel during the Gilad Shalit exchange deal, and had to see both the positive and negative sides of that exchange deal. 1,027 Palestinian prisoners were released in exchange for just one Israeli soldier. So I saw the jubilation in Gilad Shalit's hometown, but then the pain on the faces of the families who had lost loved ones in various suicide bombing attacks, or terrorist attacks, at the Supreme Court arguing against that deal. And also the elation on the Palestinian side to see their family members come and return home to them. So that's a very, very complex topic that I felt very privileged to have a window into. And I also interviewed some very notable people like President Shimon Peres, who is a stalwart in the Middle East in terms of political action and peace-seeking efforts. So that was fascinating to me. No matter where you stand on the issues that surround the region, he's one of the key players there. Also Jibril Rajoub, who was then active in the Palestinian Authority. Talking to actresses like Sarah Silverman, who come for their first time to Israel, and having a little bit of a laugh with them about their experience. A very diverse spectrum of people that I had interviewed there. GRILLOT: An amazing experience, then. You've had not only that background of a career and the movement into journalism, but certainly in Israel - an absolutely fascinating place. Our listeners will know that I've recently visited Israel and we've reported on it quite often here on World Views. So now that you're back in Oklahoma, what, if anything, can you draw from that experience? You really, as you said, entered into journalism in kind of a very unusual or non-traditional way. Getting your start in journalism in a foreign country, and then bringing it back here to Oklahoma - your hometown - and how you capitalize on some of the skills and the training and the experiences you have. I mean, you're not necessarily interviewing people like Shimon Peres here in Oklahoma City. But what is it that you could say is very similar, or what are some of the things that transfer easily from being a journalist in Israel and maybe what are some of the differences? RESHEF: Well, I would say yes, I'm not interviewing Shimon Peres on a regular basis here in Oklahoma, but every single person that I interview here in Oklahoma is just as important to me. It's important that any journalist remember that no matter whether you're interviewing a head of state, or a farmer who's having trouble with his crop, or someone who's just lost a son or a daughter, it's just as important to maintain your humanity and your integrity no matter who you're interviewing. So one of the things that we had discussed previously before this interview was the aspect of storytelling. And storytelling really to me is the same whether you're doing it in Israel or you're doing it in Egypt, or you're doing it in Syria, or you're doing it in Oklahoma. The people that you meet along the way are those who are highlighted in the stories that you tell, and it's important that you can find commonality with their narrative no matter who they are, and from what walk of life they come from. GRILLOT: Well, I think one of the things that you're really touching on there Erielle is that - and you've experienced yourself - we're all humans. We all have our stories to tell. So regardless of whether you're telling stories about what's going on in Israel, or in Oklahoma, or any other part of the world, everyone has their stories. So is that do you think, given your experience, that that's really what journalists even do for us is help us make those connections? RESHEF: Absolutely. I think the task of being a journalist is one that I take extremely seriously. Because it gives us a window into peoples' most intimate moments. Their most intimate thoughts. I witnessed many times as a journalist, but also as a human being when I was in Israel, interactions between Israelis and Palestinians on a regular basis that were incredibly friendly. Incredibly loving. Some of my Israeli friends had Palestinian friends as their very best friends, and watching those interactions you think to yourself, "How can it be that this is such an intractable conflict, when the people at their very core can find a way to get along on a regular basis?" So I think one of the tasks of a journalist is to bring the humanity and the human aspect of the people that we're talking about. Not just the conflict. When we talk about the conflict, we see on various news networks the images of conflict in the regions. Especially when you're talking about the Middle East. Sometimes it gives us a bit of a warped perspective about what actually happens on a regular basis. When I show people a picture of Tel Aviv, they're shocked because they don't realize it's a beach town with discos, and with lots of fabulous restaurants, and seaside experiences. Really active, vibrant gay community. Something that would never really notice, so that was something that was really compelling to me. It really transcends all of the different conflicts that occur in the world. There are just amazing human stories to tell, whether it's on the Israeli side, the Palestinian side, or Oklahomans right here that are dealing with issues. GRILLOT: Well something I find interesting too is the issue, particularly for journalists, of journalists putting themselves in harm's way often. Even in Oklahoma, journalists are getting out there and they're telling the stories of tornadoes as they're nearby. Journalists all over the country that put themselves in harm's way. Journalists, obviously in Israel, and now elsewhere in the Middle East, that are losing their lives, in fact. So what are the comparisons you might make along those lines, and what are some of the safety issues that you faced in Israel versus some of the safety... I mean, I know they're different - circumstances are different - but still they're there, right? RESHEF: Absolutely, and I think that's a very important issue to touch on. When I was in Israel, I reported twice from the Gaza border when there was an instance of cross-border violence. So there were Katyusha rockets and various sorts coming toward Israel, and Israel was launching operations on the other side of the border. And I was standing just next to an Iron Dome missile defense system that was deploying actively and getting rid of those rockets that were coming toward Israel. Never once in Israel did I feel unsafe. I know that may sound very strange, but I think as a journalist you get yourself into a mindset where it's so important for you to tell the story in that moment that you don't want to be reckless by any stretch of the imagination, but that you really want to try to focus on what you're doing. It's almost a coping mechanism. It helps us drown out the sounds around us. So I think that was one thing that I was able to do during that instance of violence. On a daily basis, I have to say, and this is one of those things that people kind of look at me dumbfounded when I say this. When I would walk the streets of Tel Aviv as a female by myself at two in the morning, I felt incredibly safe. I never had my purse snatched. I never was mugged. I never worried about a drive-by shooting. I'm not saying that Oklahoma is a violent place by any stretch, because I absolutely love this place, but there are definitely drawbacks sometimes to certain stories that we do. I have more of a feeling of fear sometimes in the stories that we cover here in Oklahoma than I sometimes did in Israel, and I think it's just a very different sense of personal security, and a very different sense of where we are in the world. GRILLOT: I think that's definitely a reminder to us that journalists, in bringing that sense of humanity and bringing that sense of telling the stories of different human beings around the world, that they do so sometimes at their own personal risks no matter where they are. So we appreciate the work that you do, we thank you for being with us. Hopefully this hasn't been a very dangerous experience here on World Views. RESHEF: No, it's been a pleasure! Absolutely a pleasure. GRILLOT: But thank you so much for joining us on World Views Erielle Reshef. RESHEF: My pleasure. Thank you so much for having me. Pessimism abounds as Israeli and Palestinian leaders prepare to resume US-backed peace talks next week. But government action isn’t the only answer to the region’s problems. PeacePlayers International, a nonprofit organization founded in 2001, is helping to create sustainable peace through grassroots efforts. Its programs in Israel and the West Bank bring together Jewish, Muslim, Christian, and Druze children to play basketball and develop mutual respect and understanding.